Military with PTSD Inc. and the Gourley’s (Plaintiffs) have concluded its Federal Lawsuit (seen here) directly relating to these allegations. On May 8 2018, the court entered judgement in favor of the Plaintiffs against the Defendants. Military with PTSD and its Board of Directors has endured numerous blatantly false allegations since 2013. These egregious allegations range from financial mismanagement, to embellishment of military service, to fraud. Multiple investigations have been conducted by various government agencies, as well as GlobalGiving. None of the investigations thus far have found any wrongdoing on the part of Justin and Shawn Gourley. Third party documentation (see links below), clearly substantiates the evidence submitted by the Gourley’s. Furthermore, all donated funds are accounted for and allocated. The Gourley’s commitment to the success of the organization is illustrated by their personal financial statements. All of these allegations have previously been addressed as precisely as possible without bringing harm to ourselves, the organization, or any potential litigation. Every individual at Military with PTSD has endeavored consistently to advance the work for which we are organized to do. Our focus remains on educating veterans and their families while refusing to be sidetracked by patently false allegations. However, we do take these allegations seriously. Update* we were told by a company we hired to do our taxes for the 2015 year that our Google Grant Advertising In-Kind Donation had to be included in income. However, we have recently been informed by a CPA that information was incorrect. We have recently filed an amended 2015 tax return with the correct totals, not including the Google Grant. Second, we’d like to address the allegations against our Co-Founder, Justin Gourley. The allegation is that Justin embellished or outright altered his military service record for personal gain akin to committing stolen valor. This allegation is especially egregious to us personally. Justin honorably served our country from June 30, 2000 to June 28, 2004. Justin was awarded two Navy E Ribbon’s, a National Defense Service Medal, the Armed Forces Expeditionary Medal, and two Sea Service Deployment Ribbons. However, Justin’s military and VA record clearly document that Justin had three OEF/OIF conflict deployment periods: first, 06/2002 to 12/2002; second, 01/2003 to 02/2003; and, third, 01/2004 to 06/2004. Additionally, Justin also had three periods where he received combat pay: first, 11/2000 to 12/2000; second, 07/2002 to 12/2002; and, third, 04/2004 to 05/2004. 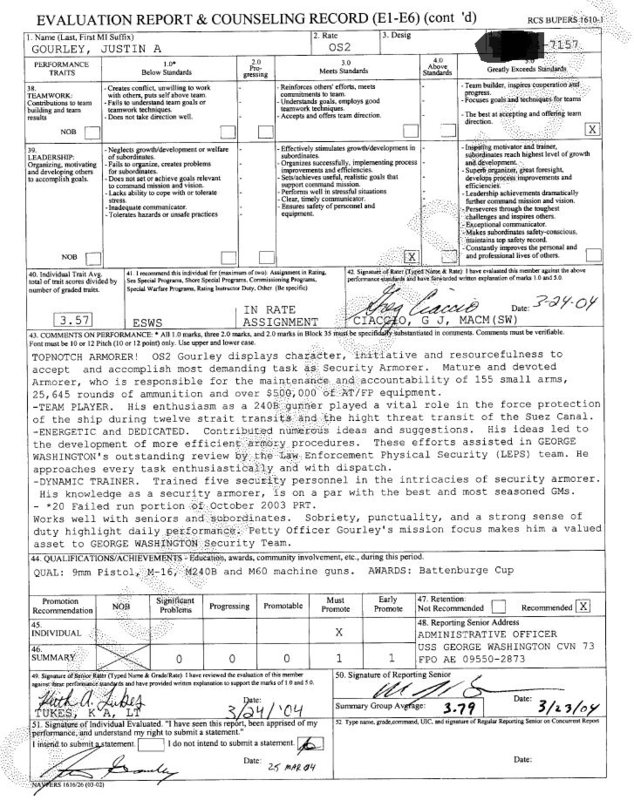 Finally, Justin had three periods of Hostile Fire/Imminent Danger pay: first, 11/2000 to 11/2000; second, 07/2002 to 09/2002; and, third 04/2004 to 05/2004. It is important to note that Shawn J. Gourley is the author of “The War at Home,” not Justin. The story alternates back and forth, showing each of their perspectives. Shawn kept a journal and was an avid note taker during Justin’s treatment, especially in regard to Justin’s perspective on their marriage. Those notebooks became the source for much of the content on Justin’s side. While Shawn had documented Justin’s words, it was her interpretation of the content and of what Justin had told her that was written in the book. Initially, the book was very brief. Upon reviewing the content, one is able to clearly see that misinterpretations had been made while writing the full story. For example, this is depicted in the initial free publication. In the 2010 edition, Shawn states, “On September 11, 2003, during a F/18 arrested landing, the arresting gear snapped back across the deck of the USS George Washington injuring several crew members. Justin had to secure the area where the injured crew members would be treated and assist in keeping them calm.” What Shawn originally wrote does not place Justin on a specific deck. To clarify Justin’s location, the USS George Washington’s Guardian Article contains key details. The following comes directly from the Guardian Article: “Although Scheer commended all his troops, the actions of OS3 Justin Gourley stood out in his mind. “OS3 is normally an easy-going, quiet type of person,” Scheer explained, “but he completely stepped up to the plate (on Thursday) and took charge by securing the mess decks, pulling hoses and maintain this watch” Gourley doesn’t think of his actions as extraordinary; he was just doing what he been trained to do. “Basically, I was just doing my job,” said Gourley, who was positioned near the battle dressing station on the aft mess decks. [Justin Gourley concluded], “We have been prepared for situations like this and it becomes second nature. The procedures are the same whether it is a drill or the real thing.” In addition to the above article, we can add an article from Navy.mil, which states: “Aboard GW, Strafford is responsible for the ship’s Mass Casualty Staging Team and Aft Battle Dressing Station. It was under (Lt.) Strafford’s leadership where these two entities shined at the critical moment. “Both stations performed flawlessly during exercises and the September flight deck mass casualty, directly saving fellow shipmates,” (Cmdr Andrew) Nelson said.” So to put these two together, Justin’s duty station at the time of the mass casualty was near the battle dressing station on the aft mess deck, which in turn was under the charge of Lt. Strafford, thus confirming Justin was in the exact area the wounded were taken. It is to be noted that Strafford later received the 2003 NAPA Leadership Award. The final issue we would like to address relating to Justin Gourley’s military service is the incident of the airman who lost his life aboard the USS George Washington. Sadly, what has been shared and posted on the internet is a draft of Shawn J. Gourley’s writing about the incident, that was never published. The draft was shared without Shawn’s knowledge or consent in what appears to be a malicious attempt to cause emotional distress or harm. Shawn and her publisher initially used a blog to write and edit. When Justin reviewed the draft, he immediately told Shawn that she misunderstood the events of the incident. The section about the airman’s accident was rewritten before the publisher convened a small group of civilian reviewers to give feedback on the ease of understanding of the first chapter (“Protector“ is only 24 pages). Revisions were made after multiple feedback sessions. Prior to the final revision, Shawn and the publisher agreed to omit non-pertinent details out of respect for the Airman and his family. In the end, a total of seven sentences covered the incident in the published book. It is important to note that a specific paragraph was added to the disclaimer addressing this issue. “The War At Home,” was written from the alternating perspectives of Shawn and Justin Gourley. The focus of the story was the Gourley’s life after Justin’s return home from his Naval duties and the struggles their marriage faced in trying to reintegrate Justin back to civilian life. In an attempt to overcome these challenges, Shawn looked for others who lived this life as she did. What she realized was that many families struggled with reconnecting due to the spouses not understanding their military family members’ perception. At that time, it was decided to write the full book showing both Shawn and Justin’s point of view, in an attempt to help educate other couples. It was written so that everyone, including civilians without extensive knowledge of the military, could understand and appreciate the struggles and lessons learned. For example, it is generally easier for civilians to recognize the job title Military Police (MP), which is on Justin’s Navy uniform badge, versus his actual job of Anti-Terrorism/Force Protection. The article Navy Swat, is just one of many articles shared in written conversation between Shawn and her publisher during the time of writing the book. Upon reviewing all of the written communication between Shawn and her publisher, it is clear that great care was taken to fact check what was being written while attempting to understand and translate what Justin was saying in such a way anyone could understand. Another aspect of the decision to keep the story easy to understand, while maintaining the purpose of the book, was that Shawn’s side would not be corrected even if the terminology that she used was incorrect. An example of this is demonstrated in the book when Shawn states that Justin had, “told her how well he had done on his sniper test.” In no way does that imply that Justin was a “sniper” or that Justin called his weapons qualification a sniper test. Shawn has no interest in guns, as such, she calls any gun with a scope a sniper gun. However, correcting Shawn’s description of details would have defeated the purpose of the “The War of Home” which was written from each of their personal perspectives. Third-party documentation presented in the links above refute the allegations that Justin Gourley engaged in acts of stolen valor. The Stolen Valor act of 2013 clearly defines the criteria by which stolen valor is punishable by law. Furthermore, the written communications between Shawn and her publisher clearly demonstrate that Shawn had made a few misinterpretations while writing the first chapter in the book. These misinterpretations are mistakes, not intentional acts of deception or fraud. While the organization could have released this documentation years ago, the allegations of fraud, for the most part, have been directed solely at Justin and Shawn J. Gourley.